BUENOS AIRES—Like many Argentine businessmen, Marco Meloni is doing everything he can to avoid laying off staff at his textile factory despite a slump in sales, more than 70 percent interest rates and soaring utility bills. 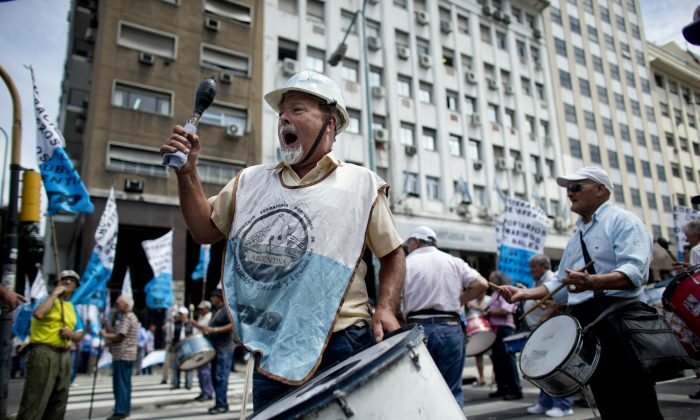 Argentina has some of the world’s most generous labor laws and they are making it more difficult for small business owners like Meloni to adapt to an economy now in recession. Typically in a tough economic climate, a company might be expected to reduce its workforce to cut costs. But in Argentina taking that step could dramatically increase costs and potentially push a company into bankruptcy. Like many small businessmen, Meloni has found himself caught in a vice. Sales from his plant in the town of Quilmes, 19 miles outside the capital Buenos Aires, shrank by just over one-third last year as Argentina’s economy sank deep into recession. While workers are staying in their jobs they are earning less because of the shorter hours and fewer shifts. Some have resorted to taking second jobs, working for Uber, the ride-hailing app, for example, according to anecdotal reports. “Making it easier to fire people or to reduce salaries improves the economic efficiency and the companies’ capacity to adjust to different situations,” he said.